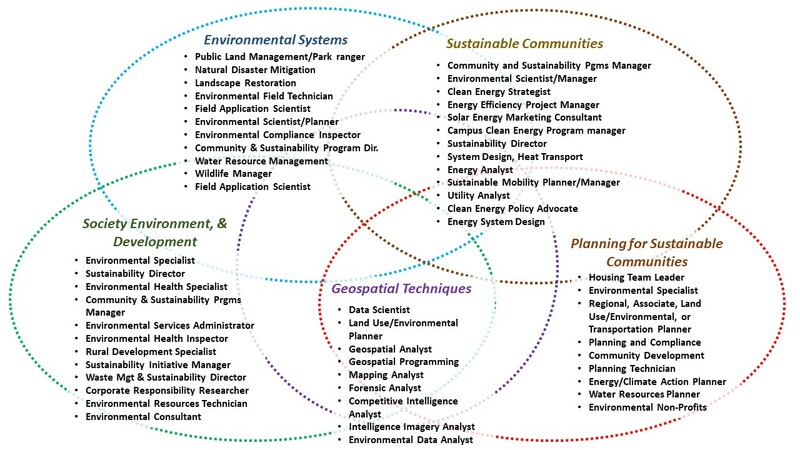 The future of green careers is very bright. Throughout the media today there are stories about the new "green collar" economy. In support of a more sustainable world and this emerging economy, the Department of Geography, Environment, and Planning at SSU offers students a distinctive, interdisciplinary and applied curriculum. A strong academic background coupled with field experiences, prepares graduates to meet the growing employment opportunities of the 21st century. Graduates have found a broad array of employment opportunities that include non-profit organizations, natural resource agencies, preserves and biological research stations, outdoor and public schools, state and federal agencies, municipalities (cities and county government), private business, and more. Our students have also gone on to graduate school at universities such as the U.C. Hastings School of Law, University of Michigan School of Natural Resources and Environment, The Goldman School of Public Policy at U.C. Berkeley, University of Oregon, University of North Carolina, University of Washington, UC Davis Law School, and many others.